Dead Weights for Calibration Kits. 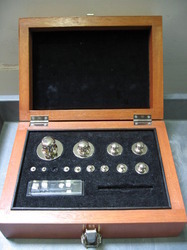 Tohnichi calibration kits for testers, meters, and gauges require dead weights to perform the tests and are sold separately from the calibration kit apparatus. Each model of tester, meter, and gauge requires different amounts of each weight in order to test 5 measuring points on the scale.